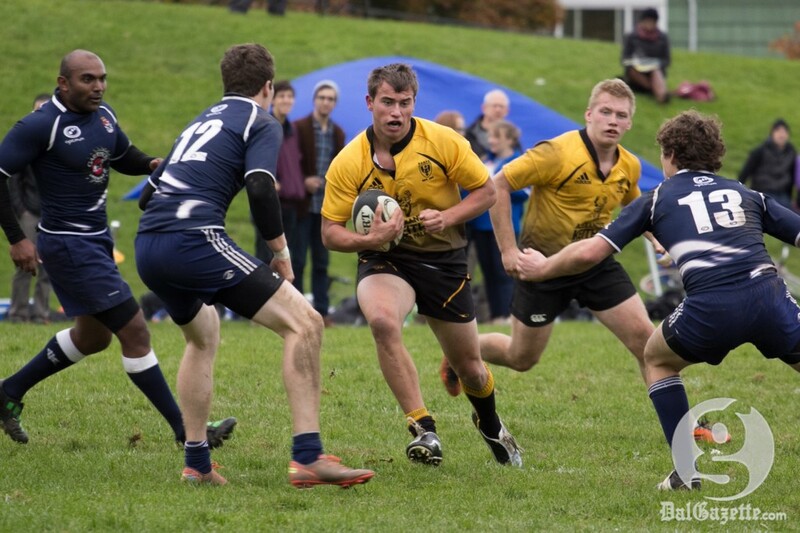 The Dalhousie men’s Division II rugby team ended their stellar season with an overtime loss to King’s on championship weekend. The Tigers lost 20-15 at Merv Sullivan Park in Halifax. Scorers for Dal were Nick Rotta-Loria and Jake Exton, each with one try. Exton also had two conversions and a penalty for a total of 10 points. It looked like a straightforward win for King’s as the game neared a close. However, Dal scored a late try to tie the game at 15, pushing the championship into overtime. King’s scored one final try during the first period of overtime, a deficit Dal was unable to erase. The game was a battle between two closely-ranked teams: first-place King’s and second-place Dal were separated only by point differential in Rugby Nova Scotia’s Division II standings. Showing agility and pace, both teams displayed clever wing play to secure their points. Fourth-year captain Emerson Hawkins says the Tigers gave it all they had. “I don’t think we left anything on the field,” he says. “We put our hearts into it; they just had the extra drive. Dal’s only regular season loss this year was to King’s in late September. “It’s sort of a grudge,” Hawkins says. “Seeing how they’re sharing the same campus as us, it’s sort of like a campus rivalry now. The neighbouring schools resumed their rivalry last fall when King’s returned to the circuit after a four-year stint in the ACAA. Next year, Hawkins says, Dal will be back to take on King’s for the cup. King’s victory this past weekend follows their title defeat last season to St. Francis Xavier. The Tigers last won the league crown in 2010.